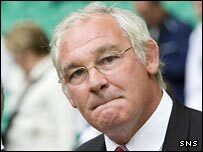 Jim Leishman has confirmed that he is stepping down as Dunfermline manager, with Raith Rovers' Craig Levein being touted as a possible replacement. Leishman has announced he will remain at the Scottish Premier League club, returning to his former role as director of football. He made up his mind after Monday's 4-0 home defeat by Hibernian. "The plan was to continue to stay until the end of the season, but I think I made the right decision," he said. It brings to an end Leishman's second spell as Pars manager. Leishman had stepped into the void following the departure of Davie Hay in May 2005 and kept the club in the Scottish Premier League with victories over Dundee and Dundee United. Bu the Pars again finished 11th last season and presently lie one place above the relegation spot once more. "It was emotional saying thanks and goodbye to the players but it wasn't a difficult decision because it's the right one for Dunfermline," Leishman told BBC Sport. "We were hoping to be two or three places higher up the league, so it's disappointing to leave while second bottom. "But I have not walked away from Dunfermline. There is a huge picture to be developed here." Pars chairman John Yorkston hopes to have a new man in place soon but Leishman's assistant, Craig Robertson, will act as caretaker manager for Saturday's meeting with Hearts. Yorkston told BBC Sport that Levein would be among their favoured contenders but insisted that nobody had yet been offered the job. "The board will meet on Sunday to draw up a shortlist and Jim Leishman will be speaking to a number of candidates before then," he said. "Jim was under no pressure from the board but his timing gives the new man time to assess the players at his disposal before January's transfer window." BBC Sport believes Leishman had put forward Aberdour-born Levein's name to the board as an ideal successor along with Livingston manager John Robertson. However, it is understood that the First Division club have a clause in Robertson's contract demanding £70,000 compensation should he leave for another club. 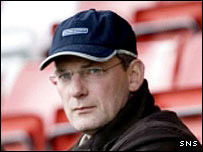 Levein, previously with Leicester City, took over at Stark's Park in September but is working without a contract. Meanwhile, Dunfermline chief executive Bill Hodgins was pleased that Leishman was remaining as director of football. "Jim has been a loyal servant since he returned in 2003 and we are very fortunate to retain his experience and skills and to benefit from his enormous enthusiasm for Dunfermline Athletic," he said.